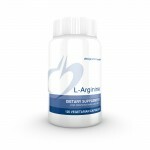 L-Arginine is a clinically useful amino acid for enhancing heart health, the circulatory system and the immune system. It is a precursor of nitric oxide, known to be important for blood pressure maintenance and healthy endothelial function. Arginine may be used along with LibidoStim-M™ or LibidoStim-F™, but is not recommended with erectile dysfunction medications. Arginine is often used with HTN Complex™ for the natural promotion of healthy blood pressure.